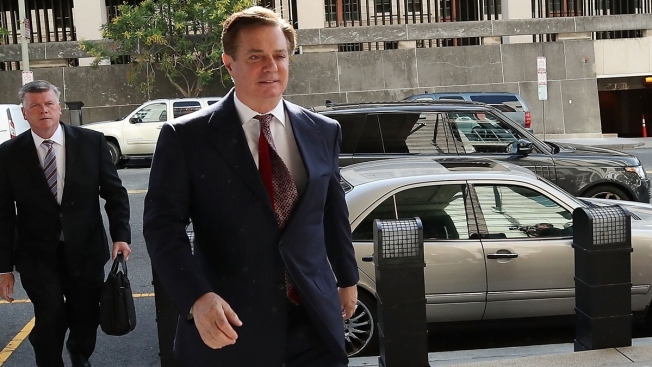 The complaint alleges that Jeffrey Yohai made false statements to investors during a lunch to the effect that "he 'turned state's evidence' on … Manafort"
This June 15, 2018, file photo shows former Trump campaign chairman Paul Manafort arrive at the E. Barrett Prettyman U.S. Courthouse in Washington, D.C., for a hearing. Paul Manafort's former son-in-law was arrested for allegedly engaging in wire fraud and identity theft in a high-end real estate scam in Los Angeles, NBC News reported. Jeffrey Yohai had already pleaded guilty to different real estate-related financial crimes and was out on bond when he engaged in activities "strikingly like" what he had earlier admitted, federal prosecutors alleged in a criminal complaint unsealed Wednesday. Yohai, who divorced Jessica Manafort in August 2017, did deals with Paul Manafort, which special counsel Robert Mueller and federal prosecutors have examined. The complaint alleges he made false statements to investors during a lunch to the effect that "he 'turned state's evidence' on … Manafort" and "that he had to go to 'D.C.'" to meet with staff from Mueller's office or "downtown" to meet with "the feds." Yoahi was expected to make an initial appearance on the new charges Wednesday afternoon.